In May 2002 four women became acquainted at a weekly exercise class specifically designed for those recovering from breast cancer surgery. During this period they were introduced to the idea of dragon boating for breast cancer survivors. In August the four met and formed plans to make dragon boating a reality for breast cancer survivors in Saint John and the surrounding area. Their goal was to be paddling on the Kennebecasis River in the spring of 2003. More survivors signed up at each meeting and they agreed on a team name Breasts Ahoy (in keeping with Maritime roots). They developed a team logo, the team colours, a mission statement, a plan to move ahead and a temporary website. 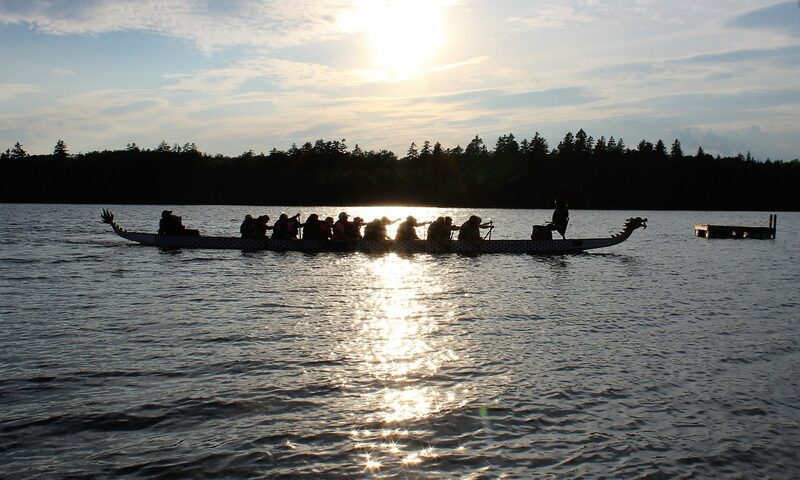 After fundraising and with help from sponsors, the team purchased a dragon boat. They received support from the medical community. The team chose an executive and formed other committees to carry on team operations. Breasts Ahoy members have attended Dragon Boat Festivals around the Maritimes, Montreal and Vermont and participated in international festivals in Vancouver, BC in 2005 and Peterborough, Ontario in 2010. The Executive Committee consists of a president, vice-president, past president, treasurer, secretary and captain. The Membership committee maintains a membership database and organizes meetings to welcome new members. The Finance Committee manages team finances. The Public Relations Committee promotes and publicizes team activities. The Nominating Committee will put forth a slate of officers for elections. The Team Operations Committee oversees paddling activities including practices and festival participation, coaching and equipment maintenance. The Fundraising Committee plans and implements fundraising activities. The Communication Committee ensures information is made available to all team members. The Sponsorship Committee sources opportunities for sponsorship in the community. The Webmaster maintains the Breasts Ahoy website. The participation of all team members is encouraged and required in order for the team to participate in paddling activities and to promote our healthy and enjoyable sport for breast cancer survivors. For more detailed information please consult the Constitution and Bylaws.